Is H&M’s strategy shifting to future-proof its brand portfolio? After opening 4,300 stores in 64 markets, H&M Group announced last week that the time has come to wind down its brick and mortar expansion and shift its focus to e-commerce and existing stores. The Swedish paragon of fast fashion has influenced the way this industry does business for decades; so what does its slowdown mean for an industry fascinated by H&M’s model? One thing is for sure, the move isn’t a reaction to any kind of downturn. The brand’s sales were up 7% for their latest financial year ending November 30 2016, so the news comes most likely as the result of a smart strategic change. One that, in the immediate sense, prevents the brand from becoming ‘over-stored’. The official reasoning from Stockholm claims the shift is owed to increased markdowns and cost of goods. But at the same time, the company says it plans to add “one or two new brands” to its brand portfolio, which already includes the higher-priced COS, & Other Stories, as well as Monki, Cheap Monday and Weekday. From that two questions come to mind: does H&M know something that we don’t about the future of fast fashion? And second, if they’re adding new brands, where will they sit in the market? Well, to shed some light on the situation, let’s explore the strategies of H&M Group’s various brands to get a look at how things stand out there in the market. To assess whether the speed of fast fashion is speeding up, staying steady or heading for a downturn, we began by looking at product numbers and levels of newness. H&M have more than 10,000 products currently in stock – that’s 5 times as many as & Other Stories. & Other Stories has twice as many products as Cos and Monki, who are similarly stocked. Cheap Monday only has about 500 products in stock. Particularly key to Cos’ low level of new arrivals is its high rate of replenishment on its styles: 28% of styles are returned to stock upon sell out. That’s more than double the rate of trend-led H&M and & Other Stories. That marks out a very different shopper for Cos. One favoring a more uniform color palette (77% of the Cos offering is black, white or grey!). In the past week (1st-8th Feb) new arrivals at H&M were down 36% from the same week in 2016. There were also 10% fewer new arrivals at Monki, 17% fewer at & Other Stories and 25% fewer at Cos. In 2016, Q4 saw 4.6% fewer products introduced at H&M than Q1. Q4 & Other Stories was down 14% but Cos and Monki both grew – Cos Q4 was up 34% from Q1 and Monki up 4%. Based on those numbers alone, you get the sense that the growth at Cos could be a hint as to where H&M’s new brands might be aiming to compete. Since & Other Stories and Monki cater exclusively to women, while Cos and Cheap Monday both do menswear (Cos also does a tiny offering of kidswear), and H&M caters to the whole family, there’s definite potential for a new brand to speak to either menswear or kidswear. & Other Stories weight accessories at 25% of the offering and tops 21%. H&M focus 28% of their offering tops and 14% on bottoms. Monki weight tops at 27% of their offering and accessories 19%. Cheap Monday weight tops at 30% and in second is bottoms at 28% (predominantly denim). That strategy gives each brand a clear point of difference, very tangibly reflected in content and store layout. Footwear falls way down the pecking order for H&M’s brands; & Other Stories is the only one giving the category double digit attention at 10% of the entire assortment. With tops and accessories well covered, a new brand could take advantage of the factories and expertise the company has in place for & Other Stories’ footwear offering to create a line that speaks to wider range of the market. Across all of H&M’s brands, the average price is highest at Cos ($62.76) followed by & Other Stories ($59.06), Cheap Monday ($55.68), Monki ($26.05) and finally H&M ($19.59). H&M’s brands stack up very differently when it comes to price range and average pricing. We can see that H&M and Monki’s pricing are the most consistent and aligned. Cheap Monday’s pricing appears to be the least matured – with products less tied to a pricing ‘rule’. Of all the brands, it has the highest proportion of its offering over $50. That’s not something particularly in keeping with its messaging or consumer. That leads into the next observation: none of the brands place much focus on the $40-60 price point. Lifting the focus there would align a brand with Topshop or even Whistles – another potential opportunity for a new brand? H&M’s Conscious Collection, though small, has a lower average price on dresses at $28.48, but lifts a little on coats at $88.12. It would be interesting to see & Other Stories or Cos introduce sustainable lines at their price point. 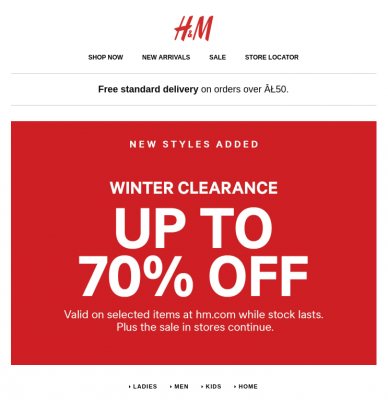 H&M has price drops every month, which is very in line with its rate of newness. & Other Stories and Cos have much more controlled approaches to discounting. They have key discounting periods outside of which very little is reduced. & Other Stories’ lower level of discounting means it tends to go in with greater first discounts (the initial price slash) than Cos or H&M. & Other Stories’ most often puts first reduction somewhere between 40-50% off . It’s the same for Cheap Monday. H&M and Cos both use 30-40%. Monki comes in at the highest, using 50-60% off at first discount most commonly. When it comes to promoting discounts, Monki lead the pack in 2016, mentioning ‘sale’ 47 times in its newsletters. No surprise given its high slashes at first price drop. H&M used the S-word slightly more than 30 times, while Cos used the word 20 times. Our data does illustrate a general slowdown in some of the ‘fastest’ parts of H&M’s brand offering. The brands its creating diversify not just the customer segment, but product offering and retail strategy as well. That makes good sense. Retailers spent the last ten years racing to have the most – across the industry – facilitated by the rise of e-commerce. That left the market pretty saturated, awash in high levels of discounting. What’s happening with H&M feels like a shoring up of offering – and a symptom of retail’s raised awareness that offering has to be unique based on retailer: there has to be a compelling story and product sold at the right price. No longer is ‘fastest fashion’ good enough. Developments in supply chain means every business has some level of access to direct to market. The current See Now By Now shows at NYFW bear testament to that. H&M could well be making the smartest move in the industry.